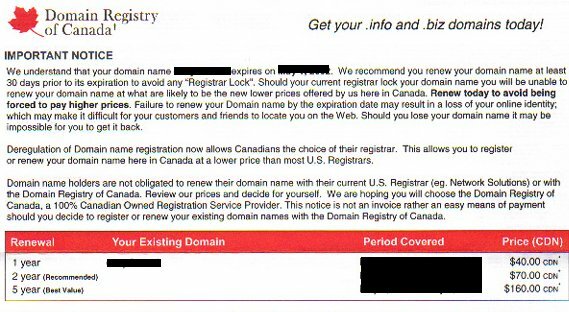 "Domain Slamming" uses aggressive and highly deceptive marketing tactics to fool people into paying for what they think is their domain name renewal. In actual fact it is a transfer to another highly expensive service although they may take your money and in some cases never even provide the service. Please be aware that we have nothing whatsoever to do with these people. If you are uncertain about anything please email us help@reg.ca and we can assist you. You may even be able to add to our list of warnings! Always go to our site to renew -otherwise you do not know what you are paying for or if you are getting anything! 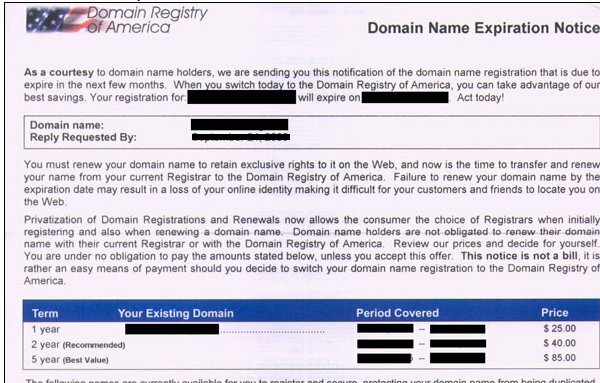 Latest seems to be www.domainrenewonline.com where you can renew anything including your dog or your spouse. I do not know if you get anything other than a debit for $80 on your credit card. We never send out snail mail for renewals. DROC or DROA among many others. This is a truly nasty scam! Watch any email sent to you that tells you to go to a link and login to due to "fraudulent activity" etc. from paypal, your bank, your credit card company etc. If you are uncertain contact these organisations directly, in fact they like you to! 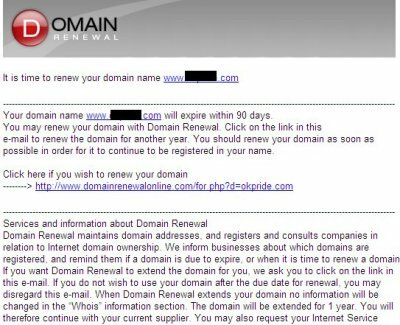 In most cases phishers will steal the company logo etc. so that it looks authentic. However if you move your mouse over the link they give you will see that the real site is very different. They harvest your login and can steal your money and even your identity!